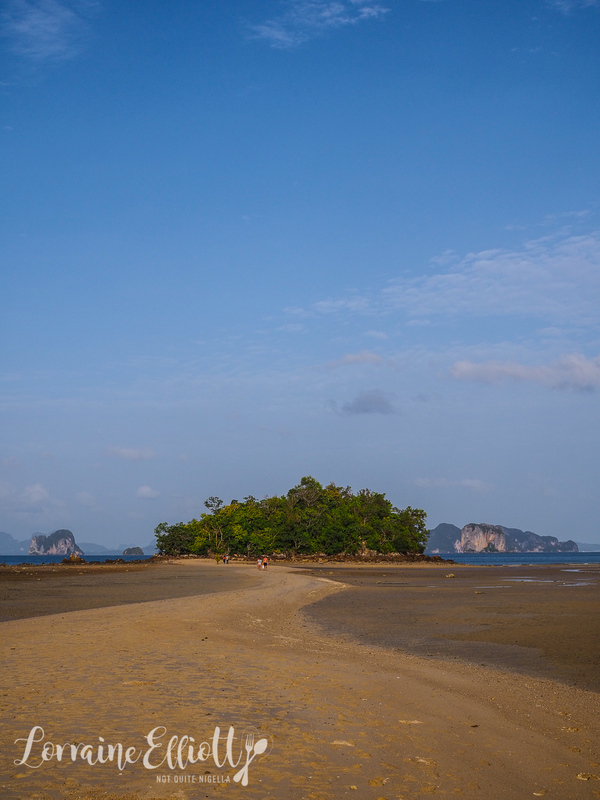 Koh Yao Noi is a postage stamp sized jungle island just 30 minutes from Phuket that holds countless treasures. Sure you can follow the well trodden paths but there's so much more to discover here with hidden local gems. 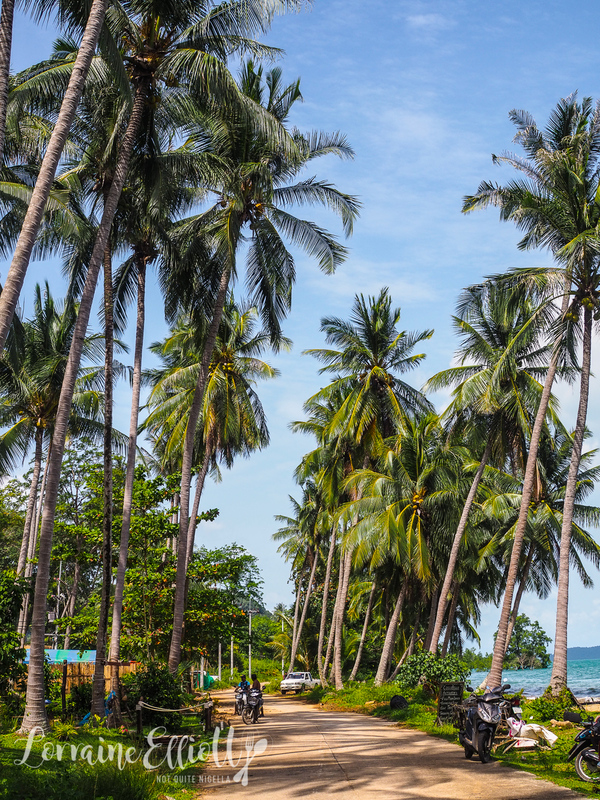 Step back in time on this dreamy Thai island and one of my favourite destinations in Thailand. There's something romantic about this tiny island. Perhaps it's the temperature which is a little less humid, less rainy and more pleasant due to the island's expansive coastline. Or maybe it's the vibe which is like Thailand 20 years ago. But while everyone works to keep its small island community vibe, that doesn't mean that they aren't welcoming to strangers. The predominantly Muslim population are wonderfully friendly and sweet. Within 5 minutes of exploring a rambutan seller drove past us saying "Sawasdee-ka!" and everyone is smile ready. To get around and see this incredible island go by scooter (although Mr NQN will argue a bike is better). Scootering is easy and you don't need a scooter or motorbike license. The hotel we were staying at Cape Kudu has a gentleman who will rent scooters for 300THB a day right outside the hotel and that includes enough gas for a day's touring (if you need more you can fill it up yourself at a low cost of around 1 litre/20THB). 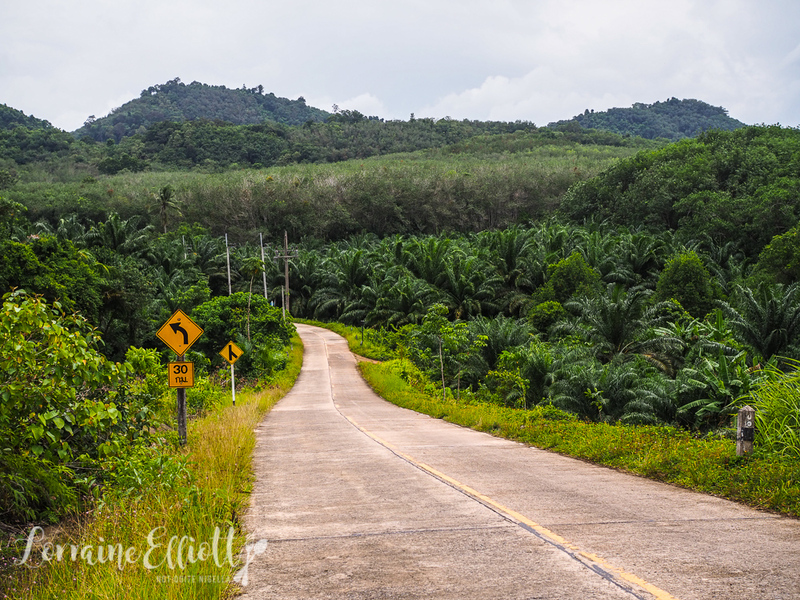 The locals are considerate drivers and it's an easy island to navigate with one main road circling the island. There are also side car scooters available for 600THB although these are a little less safe especially around the gently curving roads - we witnessed an accident involving tourists where they tipped over because they were going too fast around a corner and lost control. Number 2: Drink Fresh Coconut Juice. Around the west of the island is coconut farm where you can watch them harvest coconuts. 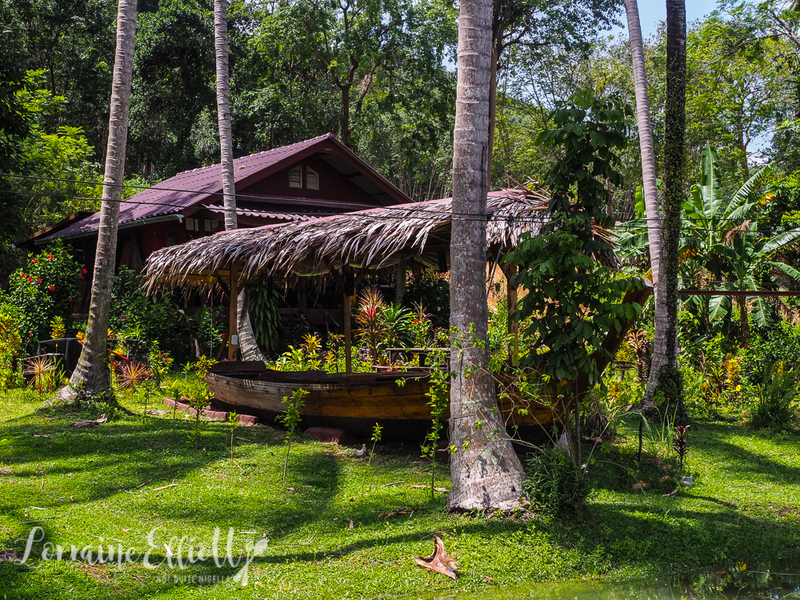 Look for the coconut trees and the staff will wave you in. Or head even further north to the northernmost inhabited tip of the island towards Cocobella where the coconut palms grow, you can stop and walk the view of the islands in the distance (including James Bond Island) while enjoying a fresh coconut grown at Cocabella's coconut plantation. 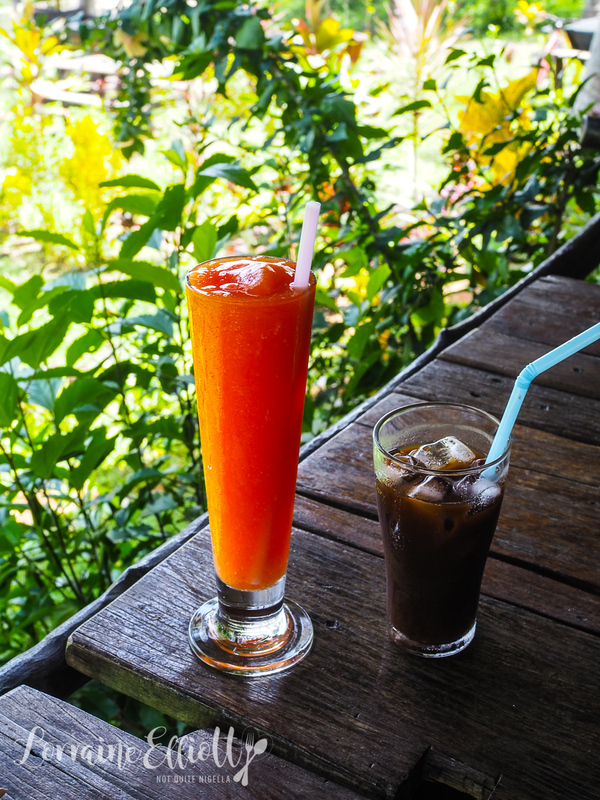 They weren't in season when we visited but we were more than content with a delicious fresh papaya shake and an iced coffee. It's also a place if you're looking for Italian food, coffee or gelato. Past the coconut farm, head towards Tha Tondo Pier. 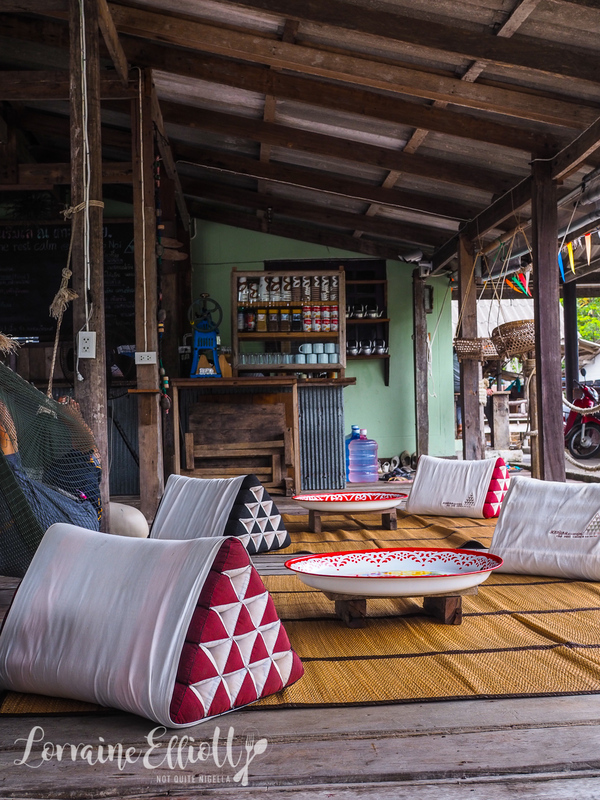 It was under construction when we visited but if you walk towards the last cafe on the right called The Rest Calm, you can lie back in a hammock and snooze or lie back on the cushions and sip an iced coffee or tea (or try the soy milk, it's nutty and delicious). 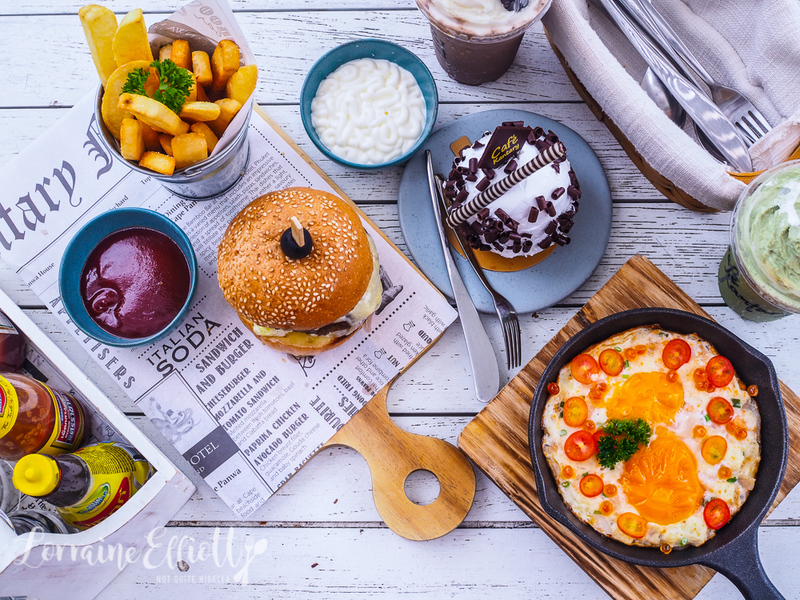 Just a few doors down on the street is what locals regard as one of the best restaurants on the island. 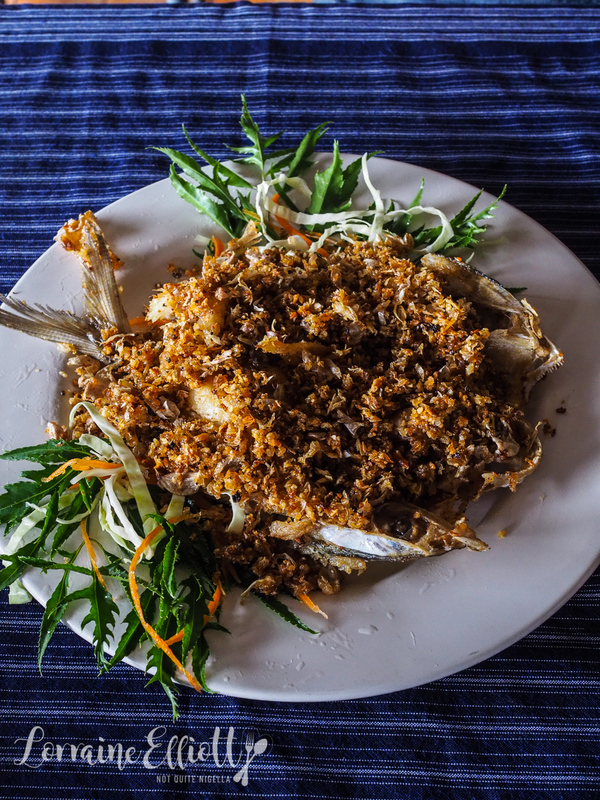 Koh Yao Tha Tondo seafood is a simple restaurant that specialises in seafood. 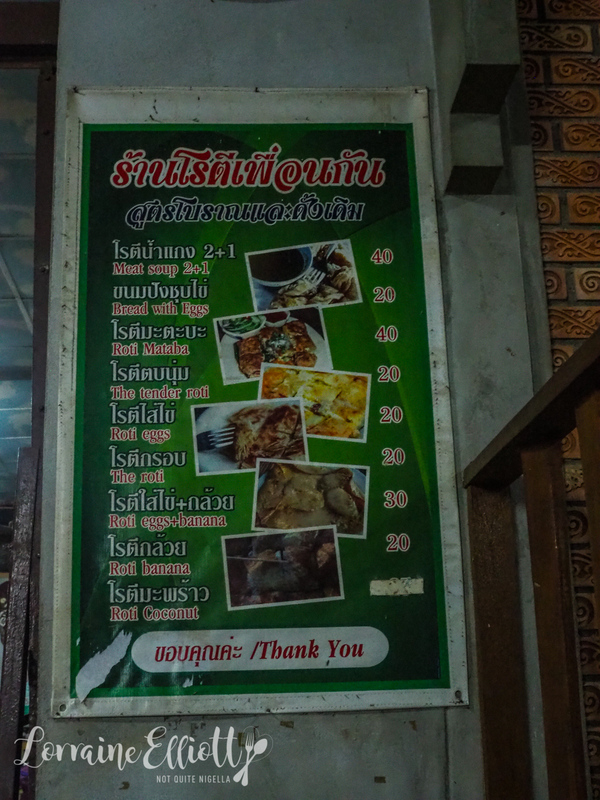 The prices are fantastic (150THB or $6AUD for prawn or crab dishes). 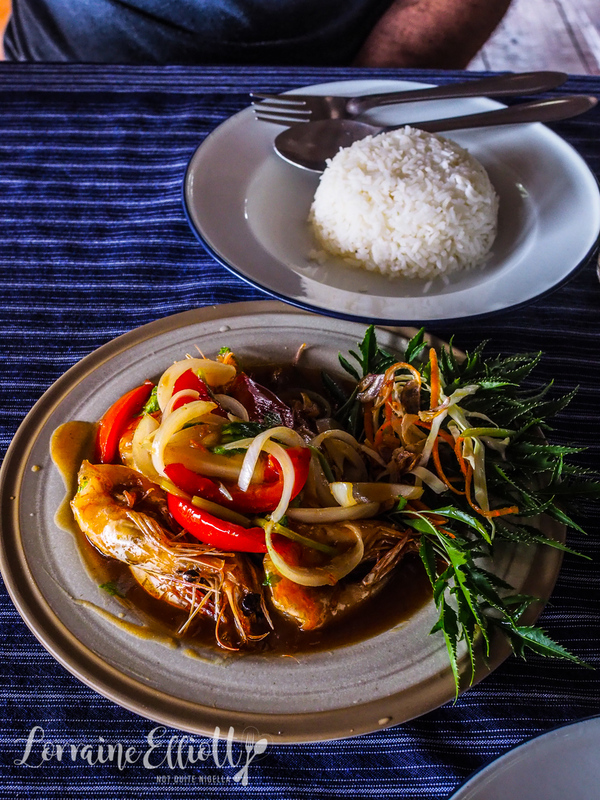 The tamarind prawns are tasty and while they are famous for their fish covered with a blanket of crispy garlic (it was a tad dry to be honest) make sure to ask for their seaweed salad aka sea grape salad with som tum flavours (an off menu item). 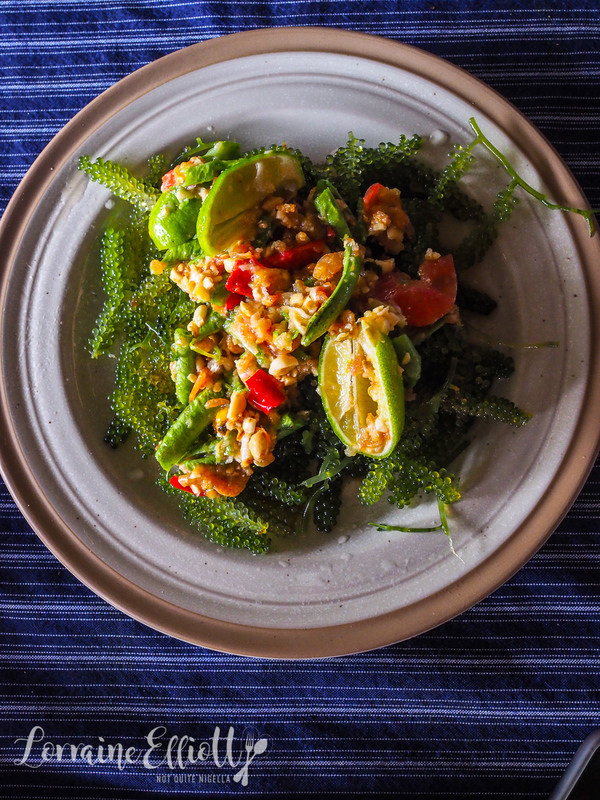 It's like a som tum salad but made without green papaya, instead these gorgeous little bunches of tiny green caviar beads are deliciously refreshing and slightly salty. There's no alcohol served here and food can take a while if there are other customers but you can busy yourself with watching tiny mudskippers make minute leaps and mud crabs bathe themselves in mud. It's better than meditating. And you won't find this place on tripadvisor (yet!). 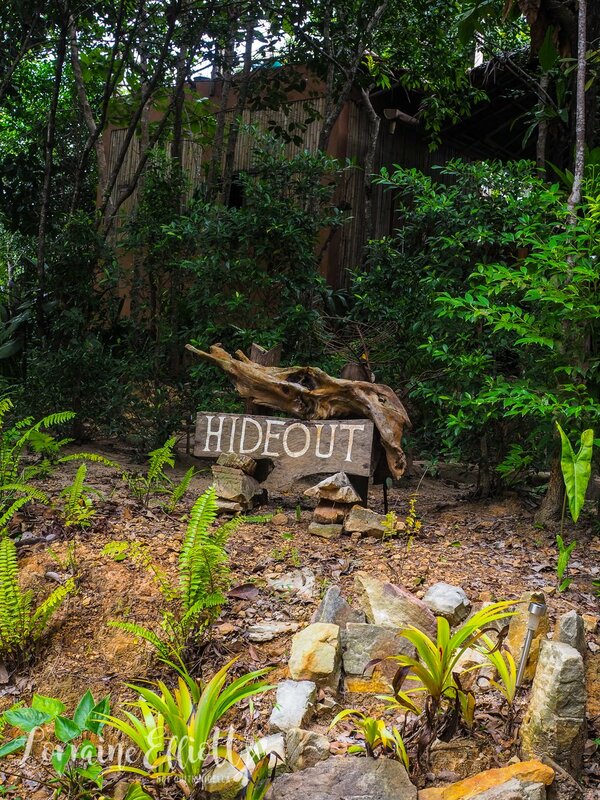 The Hideout is a unique treehouse hotel that is also a great place to stop for a drink and a swing on a hammock. 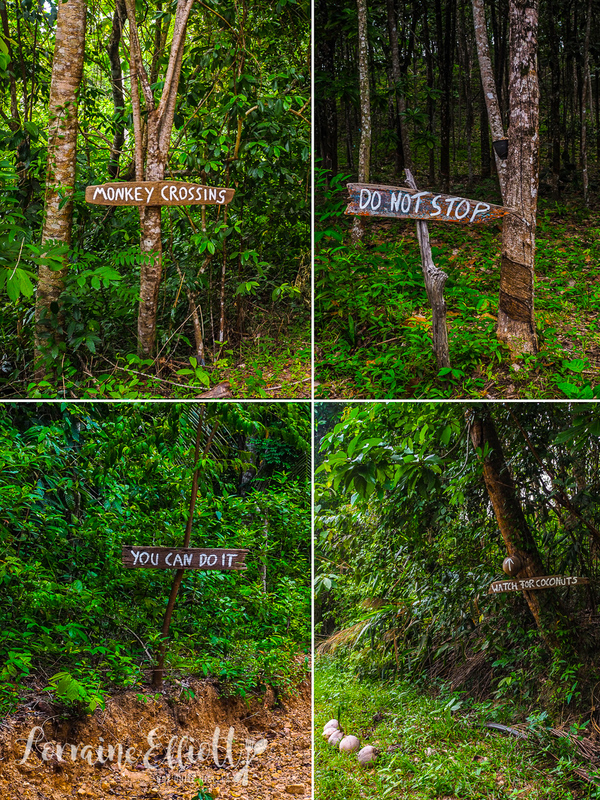 It's hidden away up a dirt road and the rocky path takes about 5-8 minutes by scooter although it is not exactly easy driving (the humorous signs are encouraging) or allow 20 minutes walking. The menu there is all about local and seasonal food and drinks. 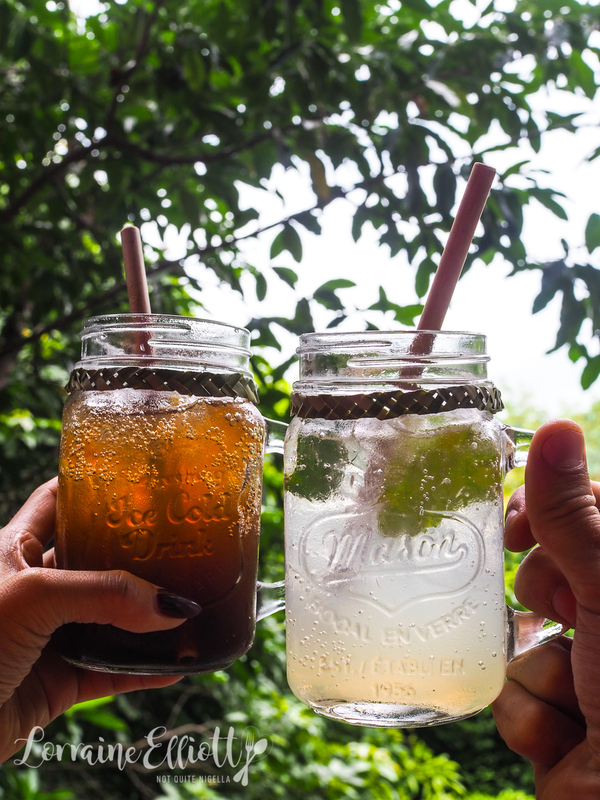 We tried a Hideout cola made with their own blend of spices (much like the way Coca Cola started as a tonic) and a kaffir limeade and both were wonderful and refreshing. Check the tide schedule and you can take a romantic walk along the beach and across the sandbank watching tiny sand bubbler crabs make patterns when they spit out little balls of sand twice a day to make their tunnels. You can also see horn-eyed ghost crabs as well as fiddler crab with one enormous claw. 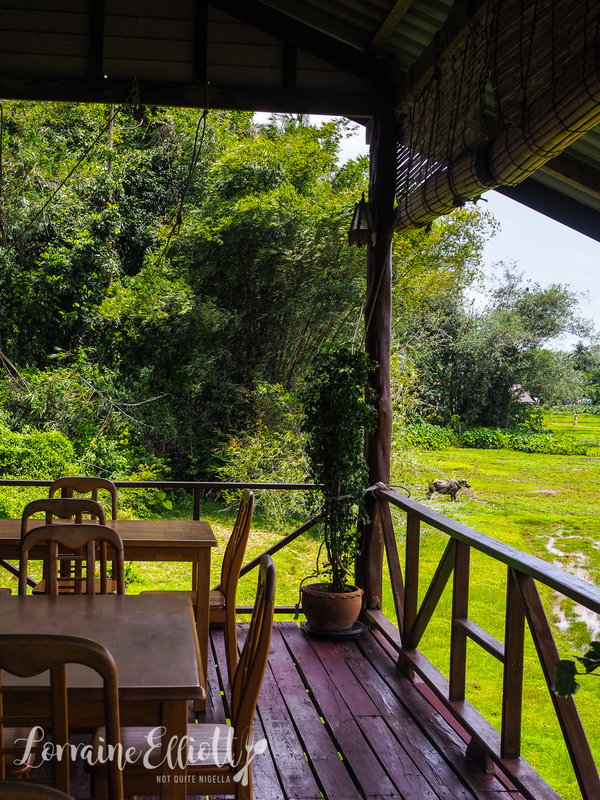 With what may be one of the island's most tranquil views, you can feast on delicious local Thai food from the extensive menu while overlooking rice paddies. 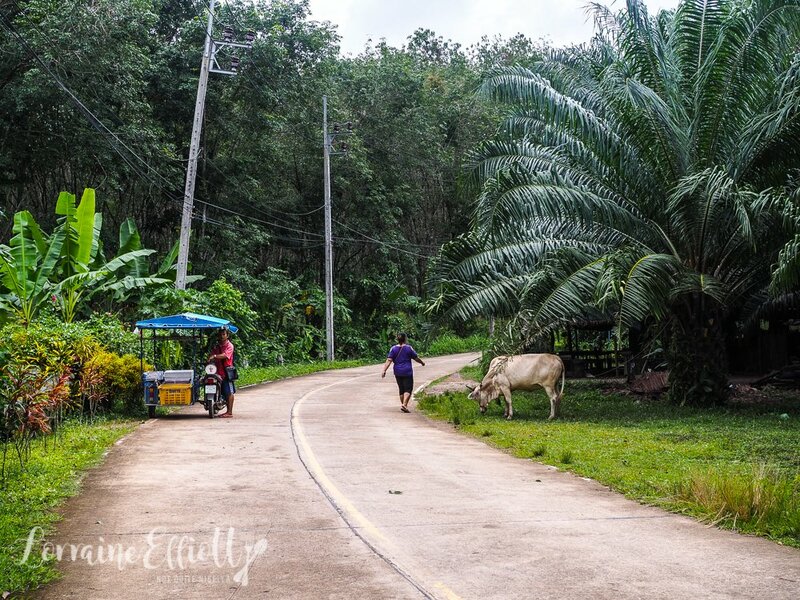 In the corner a water buffalo picks leaves from the trees while cyclists ride past and a tractor worker toils in the hot sun. Prices are reasonable and feature a lot of seafood. 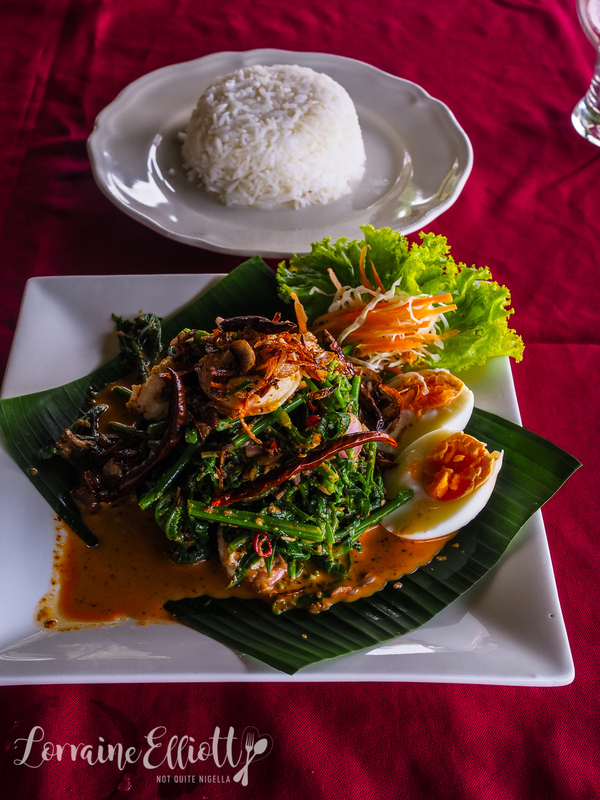 You can of course get classics like massaman beef or pad Thai but it is worth seeking out the interesting dishes like the spicy fern vegetable salad with prawns and blanched greens. 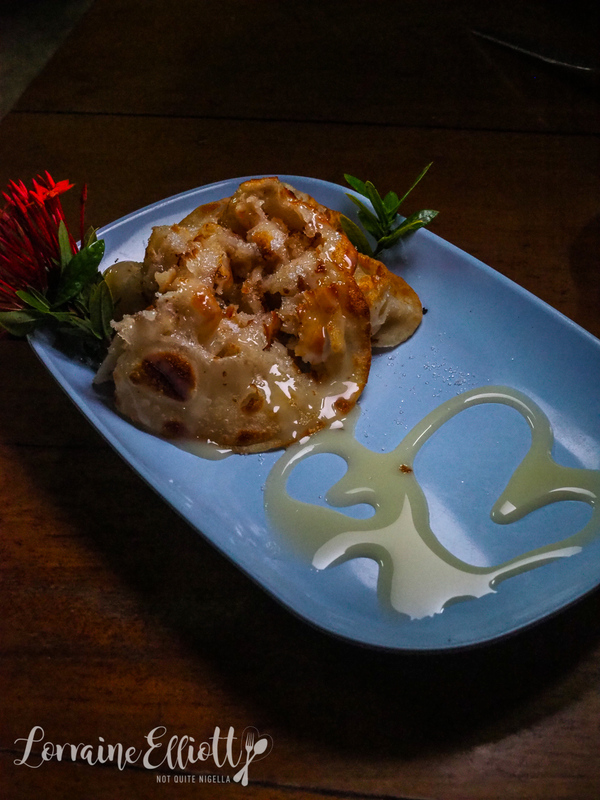 Or the fried banana blossom cakes (200THB) are delightful too along with the squid with garlic (180THB). 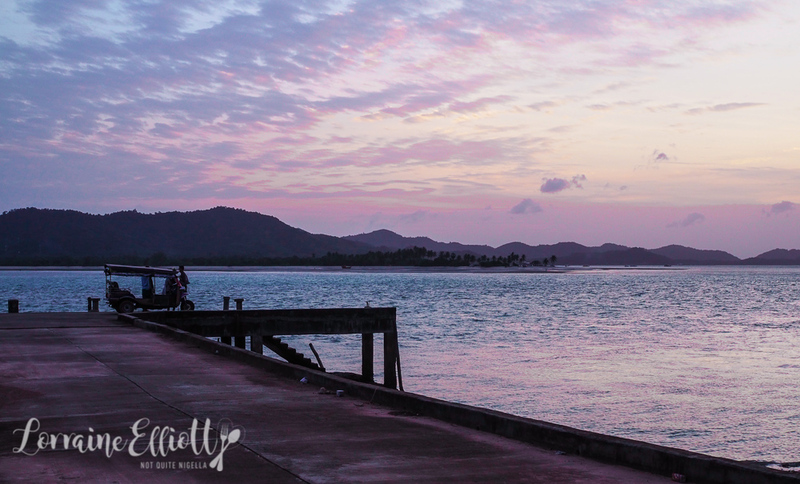 A little warning: an amazing sunset can be an elusive beast on Koh Yao Noi because of the omnipresent clouds. 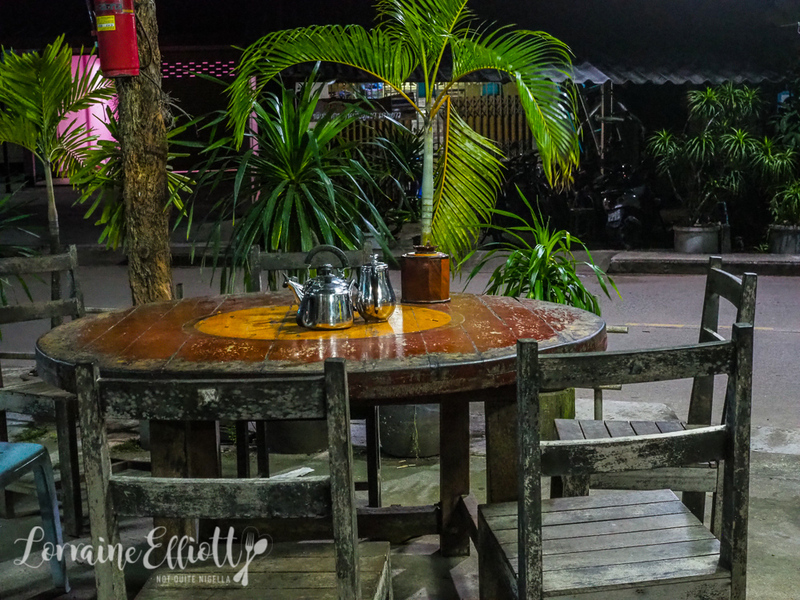 During our entire stay there weren't any spectacular ones but if you happen to have a clear day head to Rice Paddy View Point or Laemsai Pier. Come 7pm every night, I made my way to Rotee My Friend for a fix of fantastic roti. It's open every day but only from 7pm-10pm. It's also a favourite late night haunt for taxi drivers in lieu of an after work bar. Yes there are cats galore but be prepared for some amazing roti. 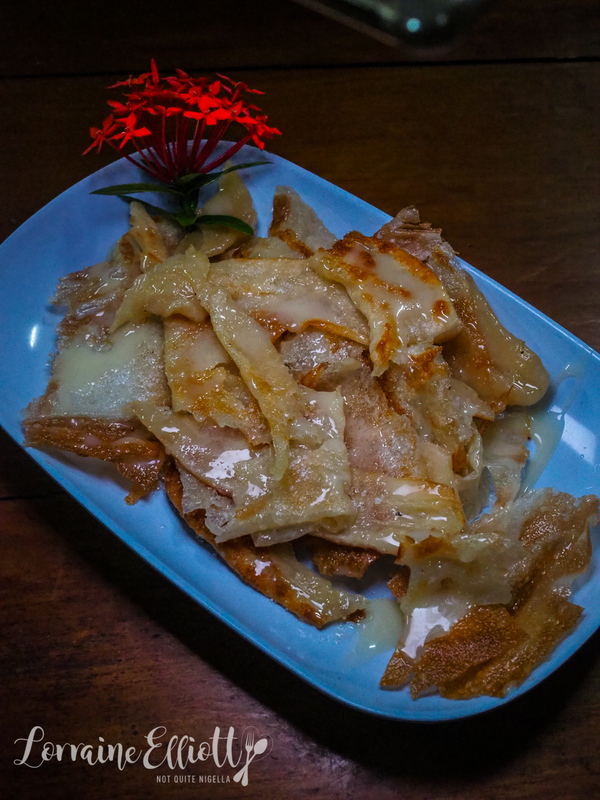 The "The Roti" is roti tisu, a heavenly paper thin, super crispy roti glazed with sugar and sweetened condensed milk that comes pre-cut (I'm drooling thinking about this). While the "tender roti" is a softer version with the same flavours with roti that has been "clapped" to soften the edges and give it volume. It will be the best 20THB or $0.85AUD you'll spend. Need a blast of air conditioning? Or maybe a fix of coffee, cake or a cookie? 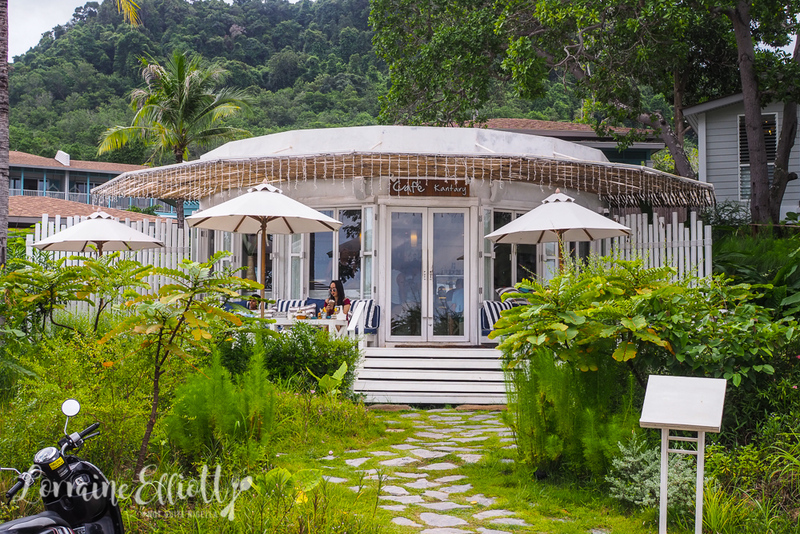 Cape Kudu's Cafe Kantary is a stylish white and blue cafe with indoor and outdoor seating. There's nothing quite like it on the island and there's a reason why people stop and take selfies or photos here. The coffee is said to be the best on the island and tip: get one of their soft choc chip cookies. In fact any of their cookies are great. 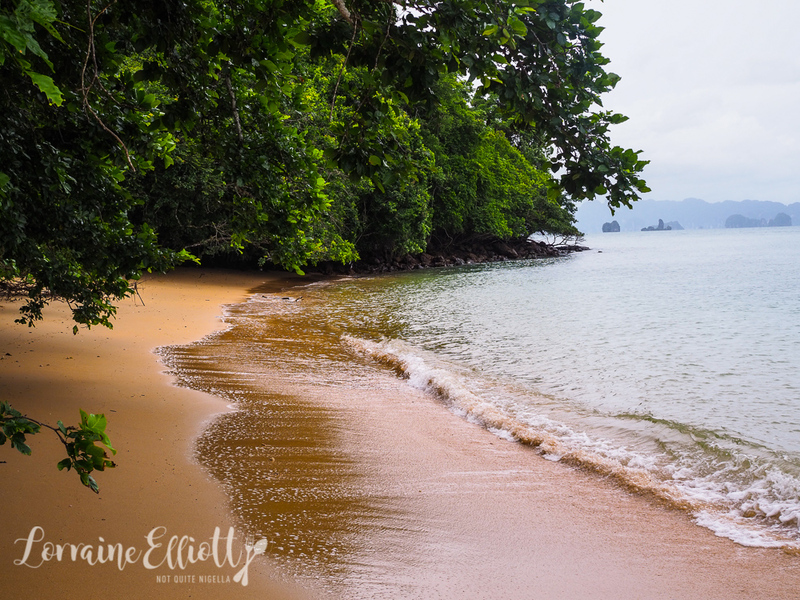 There are perhaps better islands for beaches and sunbathing as the beaches are ringed by coral and rocks so you do need wait for high tide to go swimming but Koh Yao Noi's best beach is Long Beach a hidden away golden sand beach, the second best Pasai Beach. Be careful getting to Long Beach by scooter if it has been raining as you may have to deal with dirt roads, muddy paths and long grass. 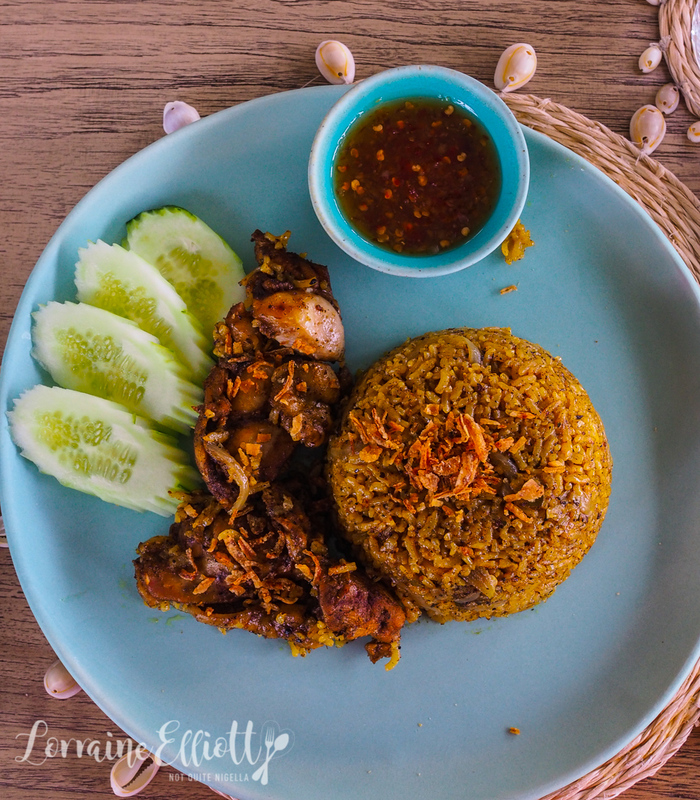 There are no shortage of Thai cooking class and the cuisine itself really lends itself to shorter cooking classes as the food is simple to put together but very tasty and easy to replicate at home. 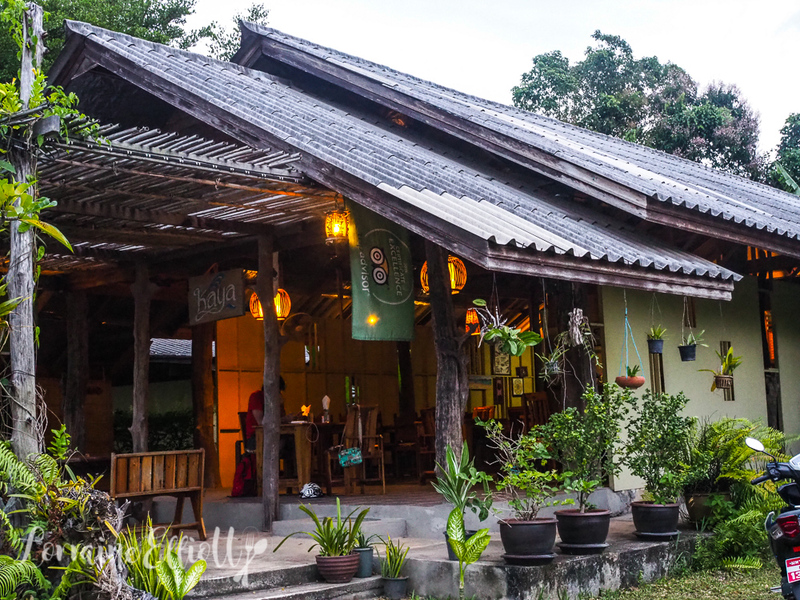 Most cooking schools specialise in the classics like spring rolls, green curry or tom yum soup but at Cape Kudu's cooking school you can also make special requests for custom classes to explore Southern style Thai cooking or the muslim food of KYN both of which I requested. We made Thai chicken in gravy, a Muslim yellow rice with chicken that I had for breakfast and a Southern crab curry that you rarely see in Australia but is utterly delicious. 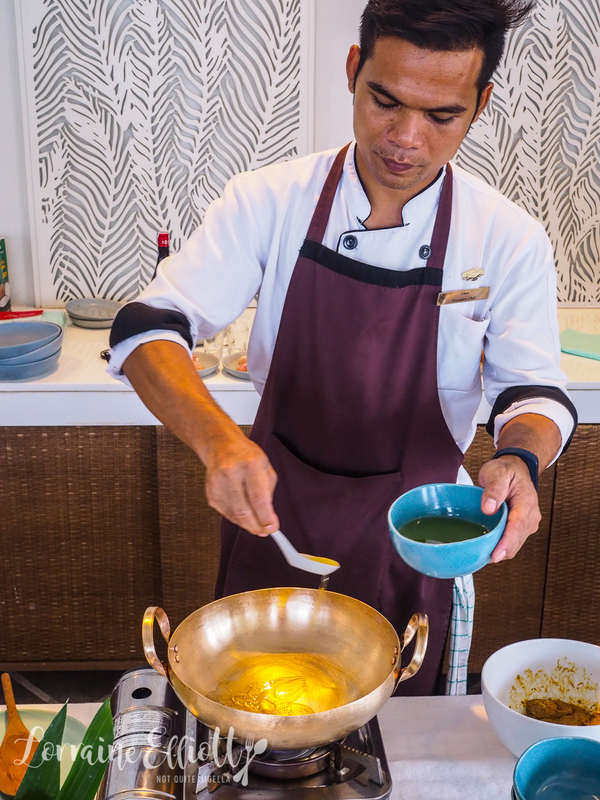 It's a hands on cooking class so you do all the cooking under the guidance of chef Chan and an English speaking staff member who will help interpret. Better still you get to sit down and feast on everything that you have made. 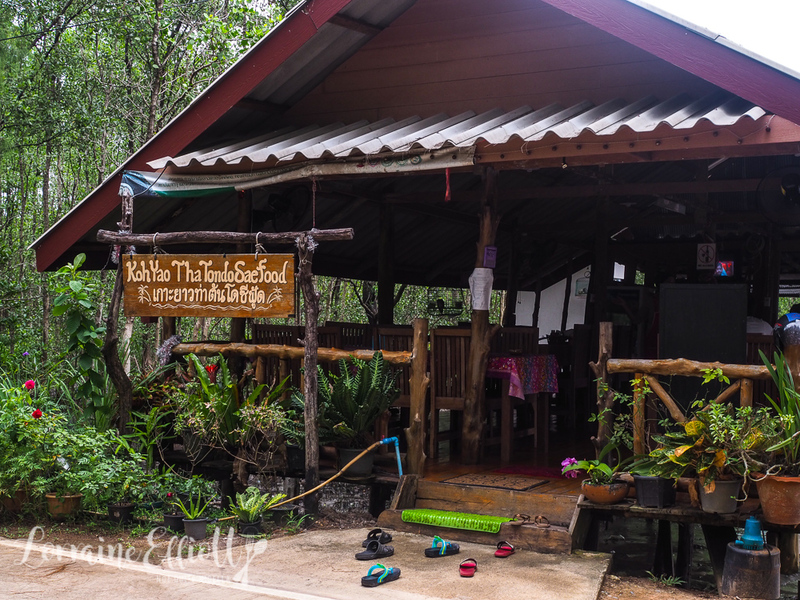 The lovely little local restaurant is located on the south east of the island and the all female run restaurant has a large menu full of Thai favourites with very reasonable prices. Service is absolutely delightful and you won't find a sweeter bunch. 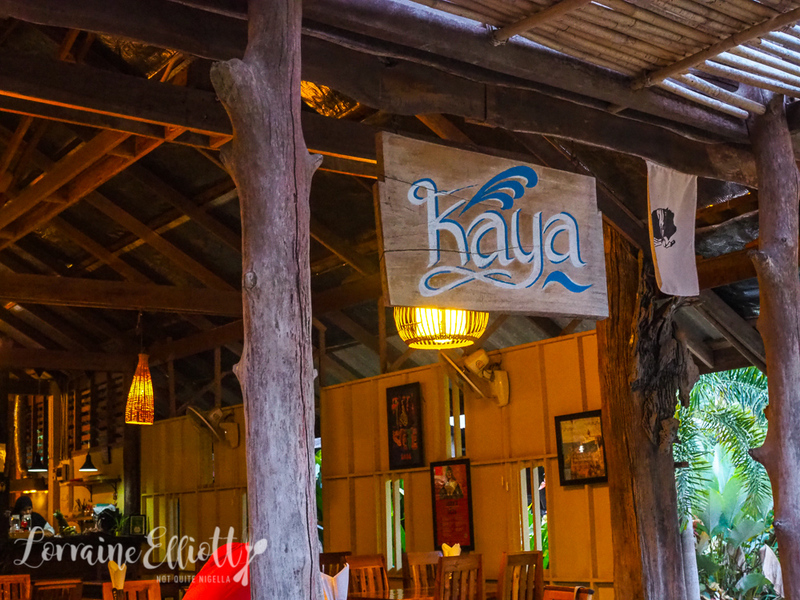 There's a reason why people eat here several times during their stay at KYN. 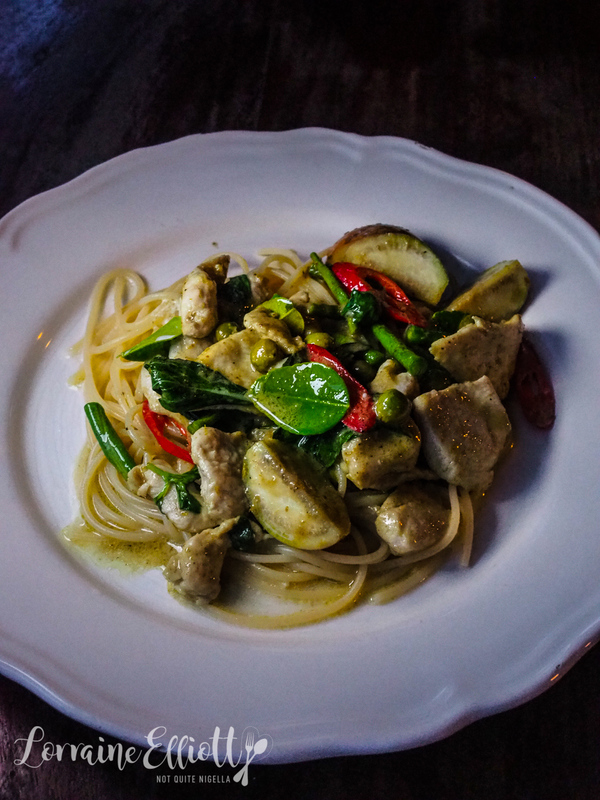 Try their sweet and rich massaman beef curry or you can always try a fusion way of serving green chicken curry with their green curry spaghetti which is absolutely delicious. 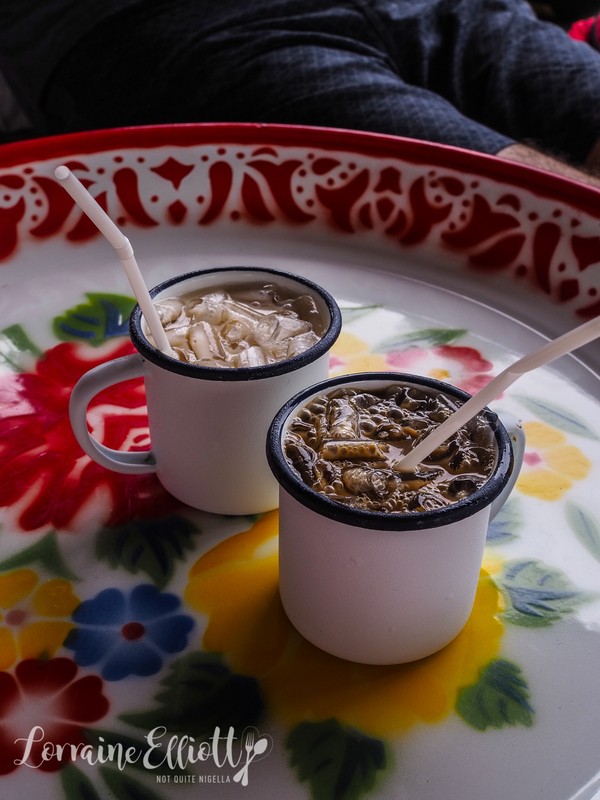 Desserts are mango and sticky rice when in season or the wonderful comfort of bananas simmered in coconut milk. 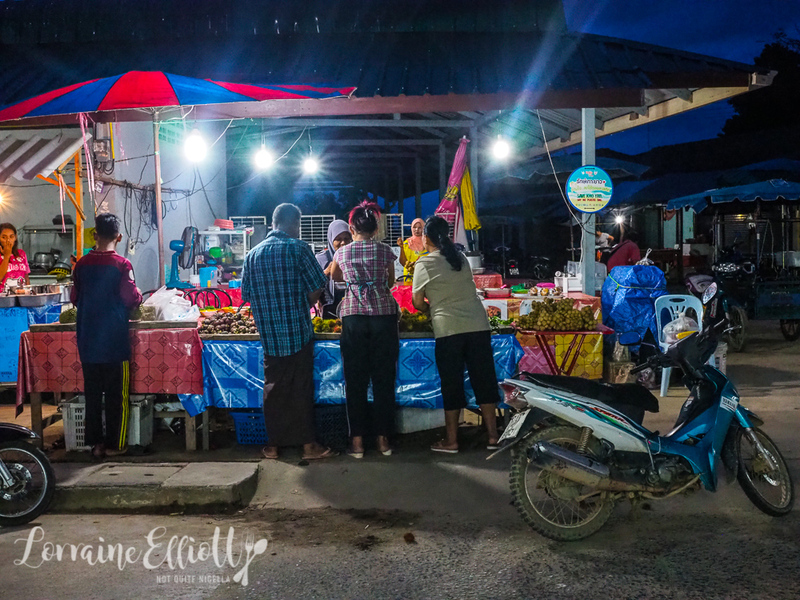 There are plenty of street food stalls dotted around the island as well as mobile vendors. 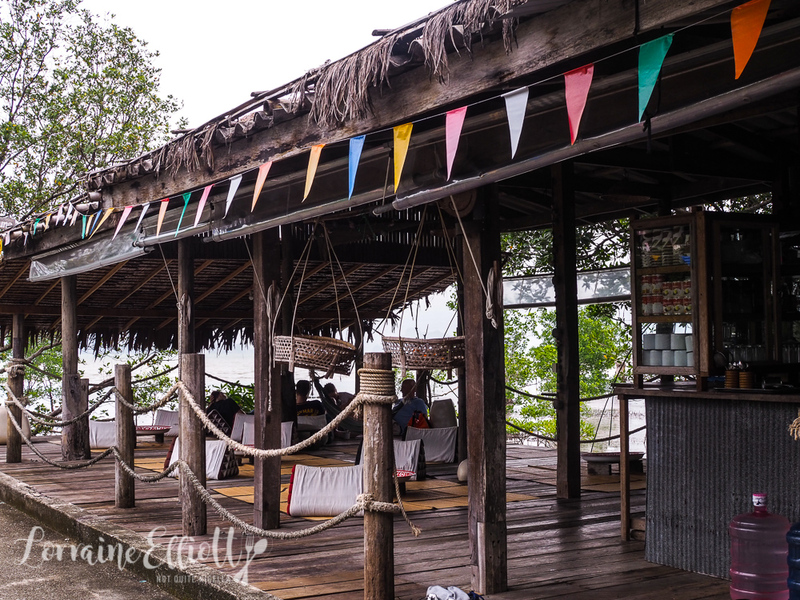 Many of them are around the Pasai Beach area although waterfront outdoor eateries mainly dominate there. 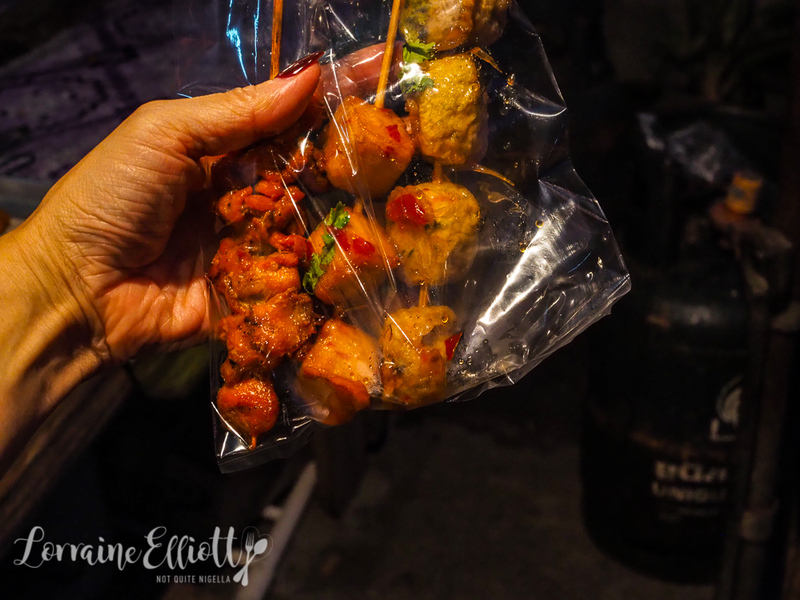 if you want to try street food, head towards the 7/11 (yes it's a landmark and it was a big deal when the island got one). Around that area there are plenty of street food vendors. There's a Southern style curry vendor who has four metal containers with different curries. 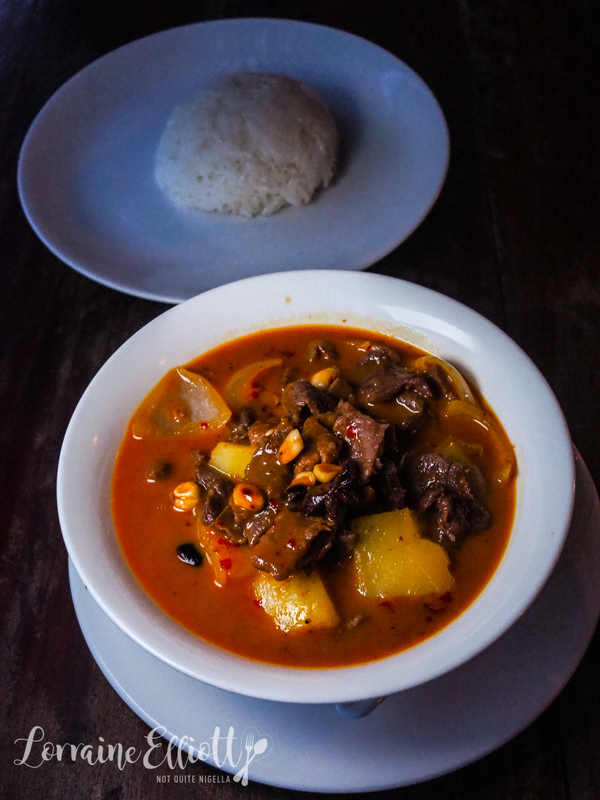 Southern Thai style curries are lesser known due to lack of exposure but they're absolutely delicious with a saltier and more sour flavour - you won't really find overly sweet numbers. You can choose a curry or two and help yourself to the dozen or so vegetables. 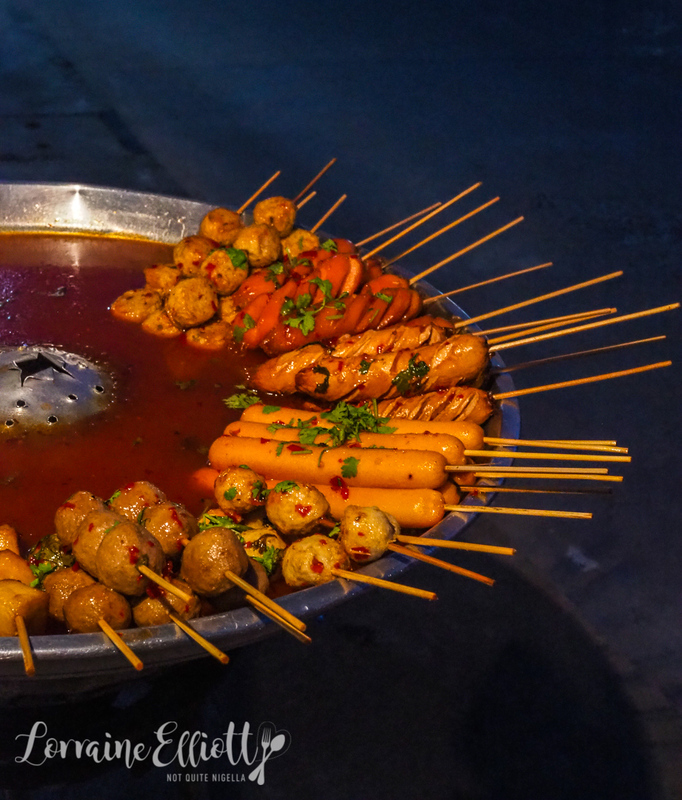 There are also fruit vendors as well as a vendor who sells things on sticks-there's no pork here obviously but the chicken and fish sticks are absolutely delicious. 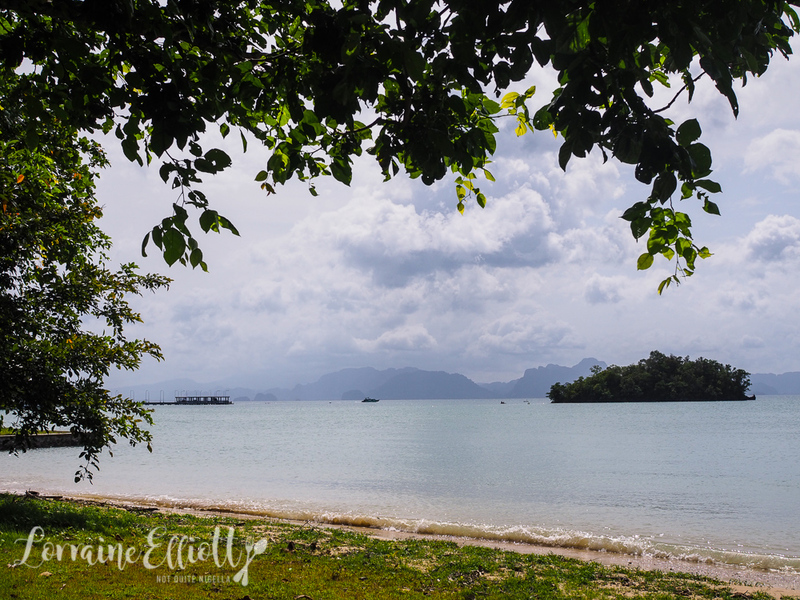 So tell me Dear Reader, have you ever been to Koh Yao Noi? What is your favourite way of getting around a city? Bike? Scooter? Train? Car? The easiest way is to get there by speedboat of longtail boat from Bang Rong Pier in Phuket. These leave around once an hour. Most of the transfers are by speedboat (a 30 minute trip) with the occasional speedboat being substituted by a longtail. 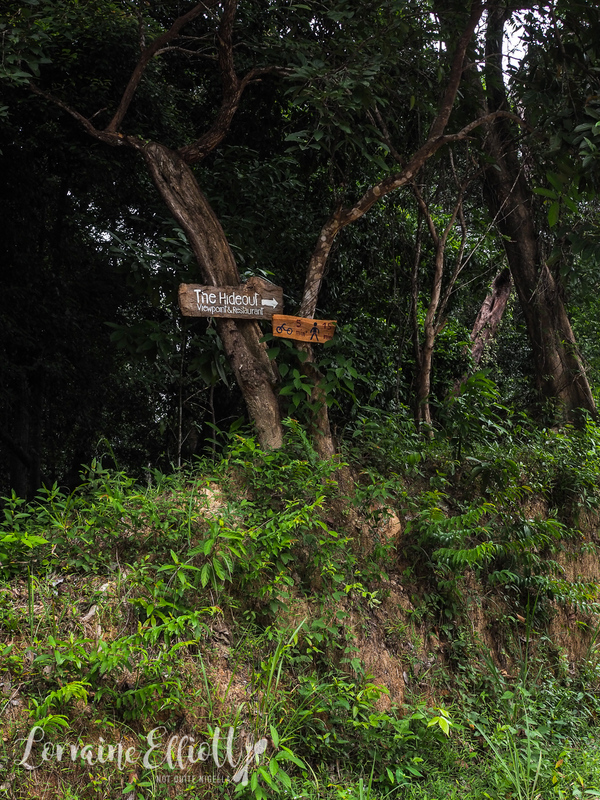 There is also a helipad on Koh Yao Noi if you wish to arrive by helicopter. Scooter or bike is the absolute best way to see KYN. These were available just outside our hotel and cost 300THB for 24 hours (600THB for ones with side cars). If the petrol runs out you are expected to top it up yourself so make sure the tank is close to full when you rent it. 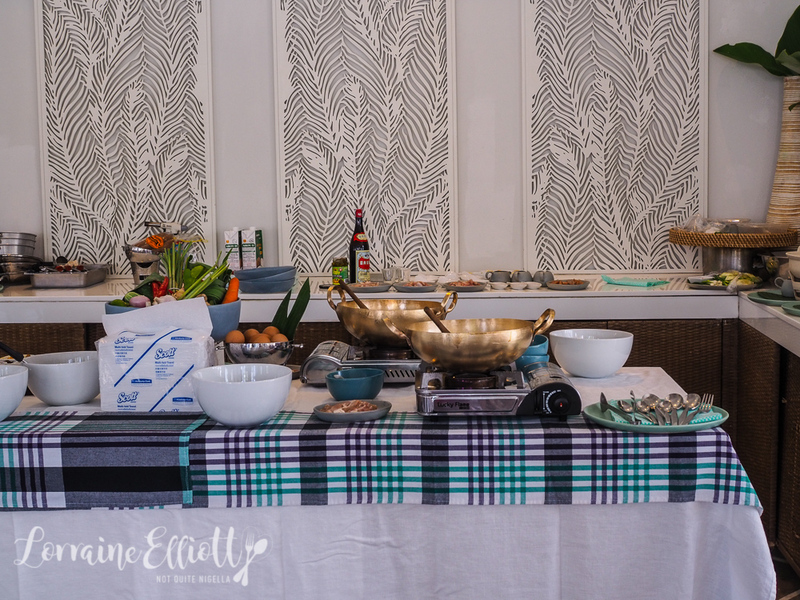 We stayed at Cape Kudu, a Small Luxury Hotel and I cannot recommend it enough. 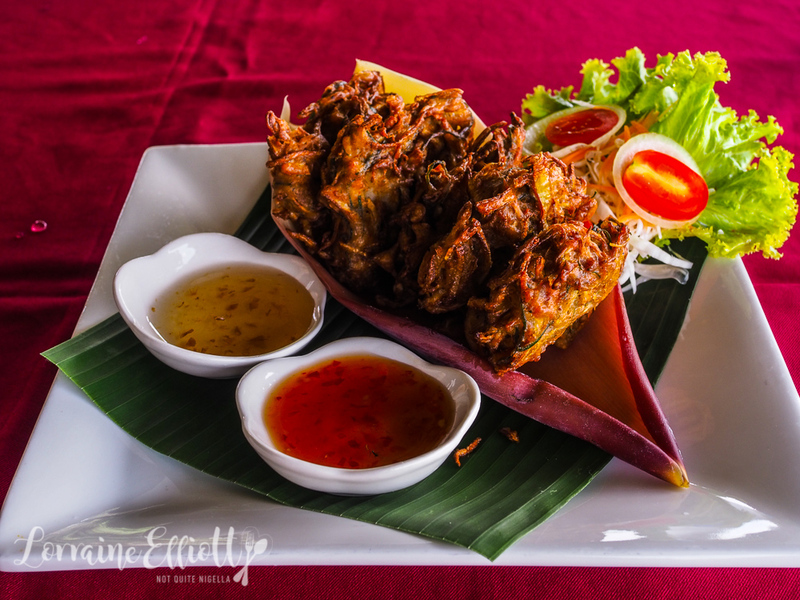 It is an excellent location and the staff are lovely, pool villas are gorgeous and the food is very good. 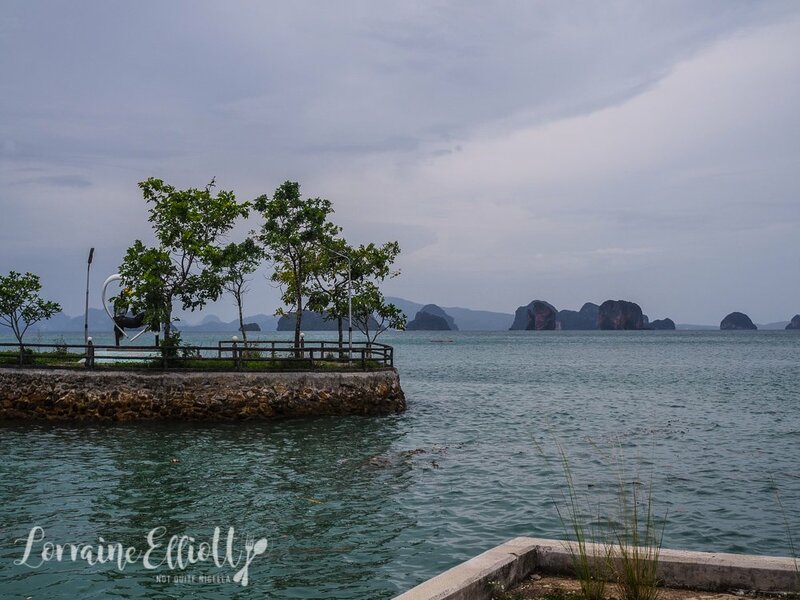 The best time to visit Koh Yao Noi is December to April as monsoon season is June to November. However we visited in the first two weeks of August and while it rained on a couple of days, the rain didn't last for long. If you want to see what Thailand was like 20 years ago. 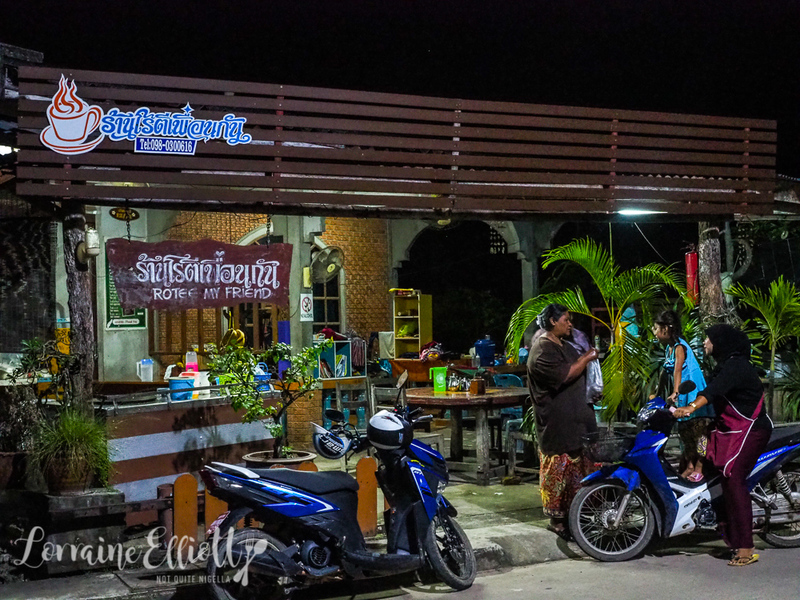 If you want to meet the friendliest locals (they are said to be the friendliest in all of Thailand and I'm inclined to agree). If you want to explore an island that is not over developed. If you are looking to relax but not be bored. NQN and Mr NQN stayed as guests of Cape Kudu but all meals and experiences outside the hotel were independently paid for.